Starring Laurence Olivier, Flora Robson, Vivien Leigh, James Mason, Raymond Massey and Leslie Banks, directed by William K. Howard. This star studded period piece covers the volatile reign of Queen Elizabeth and her struggles with Spain as well as her own court. Robson is mesmerizing as the Queen, and Laurence Olivier hints at his future mega stardom as the dashing Michael Ingolby, savior of the crown. This production matches it’s amazing cast with glorious sets, adventure, intrigue and romance around every corner. It’s also the 3rd CMNYK screening to feature the great Leslie Banks. 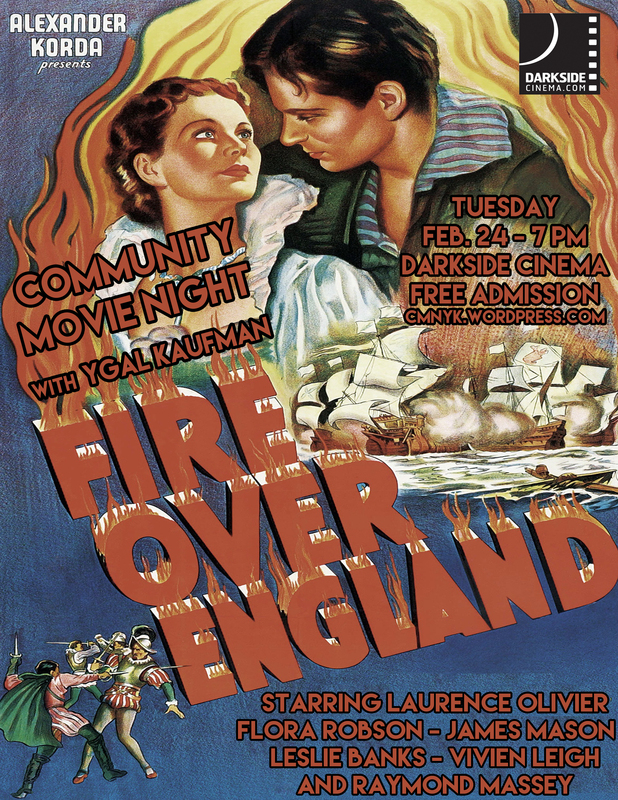 Better get there early, the last time we screened a Laurence Olivier picture, it was standing room only. And of course this screening will feature amazing newsreels, shorts, soundies, cartoons and other treats from 1937 to really take you back. Don’t miss this, the 35th edition of CMNYK, at the Darkside Cinema!